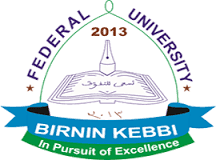 Federal University Birnin-Kebbi, FUBK 5th Matriculation Ceremony for Freshers / Newly Admitted Students Holds on 30th January, 2019. Date: Wednesday, January 30, 2019. Venue: Frontage of Administrative Block, Main Campus.